There are some coconut haters out there. But that's just fine, because that means there's more of this exceedingly decadent coconut cream bread pudding for the lovers to share. This delicious dessert comes by way of Paula Deen's The Deen Family Cookbook . As the grande dame of get-fat-quick desserts herself says, "the rich coconut pudding with a nice pool of chocolate sauce all around brings me back to the days when me and Bubba would count out all our change to buy mounds bars on the way home from school". Like a Mounds bar all grown up and decked out in its after-dinner best, this dessert is bound to make you both very fat and very happy. Lightly grease the bottom of a 9-inch square flameproof baking dish. Arrange the bread cubes evenly. In a large bowl, whisk together the yolks and eggs, coconut milk, cream of coconut, salt, and nutmeg. Stir in 1 1/2 cups of the coconut flakes. 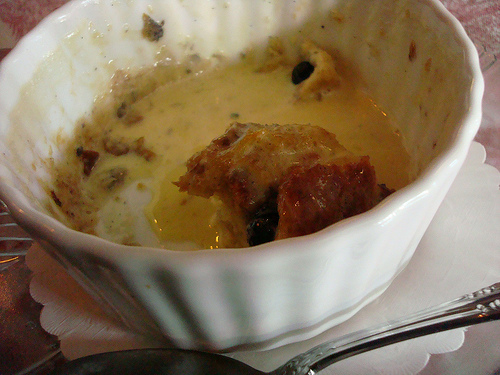 Pour the custard over the bread cubes. Press the cubes gently to soak up the custard. Let the mixture stand for about an hour in the fridge (covered). Preheat the oven to 325 F. Sprinkle the top of the pudding with the remaining 1/2 cup coconut flakes. Cover the dish with foil, poking a few holes so that steam can vent. Place a roasting pan on the oven rack and put the baking dish in it. Pour hot water into the roasting pan to come halfway up the sides of the baking dish. Bake until the pudding is firm to the touch, about 1 hour and 15 minutes. Remove the foil and bake for 15 minutes more. Remove the baking dish from the water bath (carefully!) and run it under the broiler, at least 4 inches from the heat, until golden (1-2 minutes). Let the pudding cool completely. Make the chocolate sauce directly before serving. Place the chocolate chips in a medium saucepan, and melt on low heat. Pour the cream over the slightly melted chips and continue stirring on low heat until you have a smooth, creamy mixture. Add more cream if desired until it has reached your desired consistency. Drizzle over each serving.